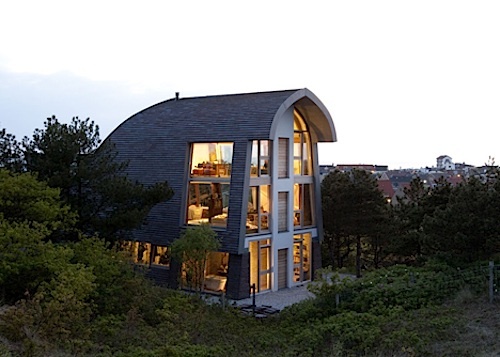 Here’s an interesting house on the sand dunes in Holland by Dutch architects Jetty and Maarten Min. 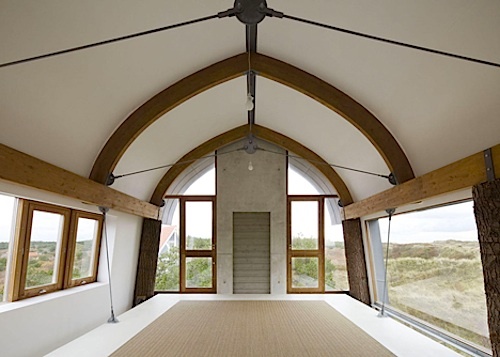 It is the architects’ own rather quirky live/work studio home. 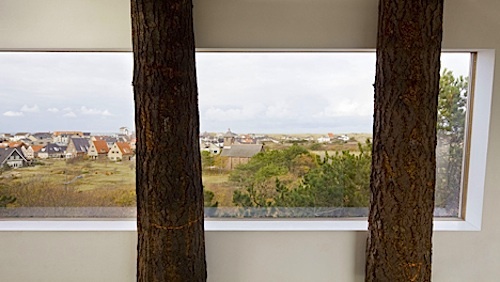 The owner-architects had always wanted to experience living high up with a view out to sea over the sand dunes. 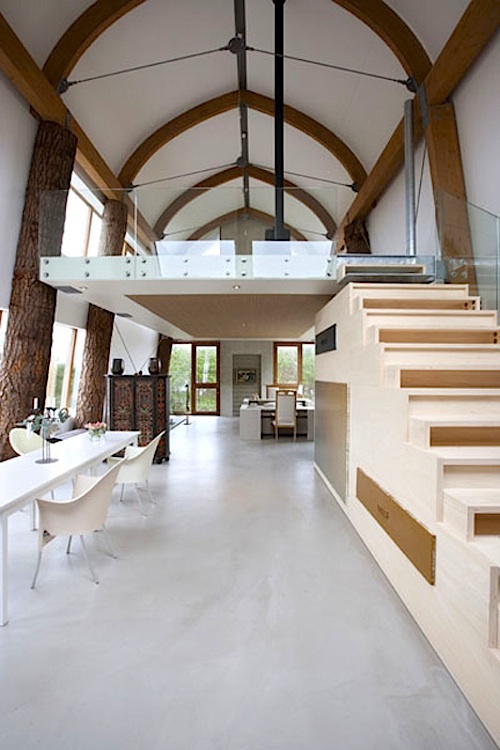 Amusingly, tree trunks are put to use in their natural state to be supporting struts within the house. 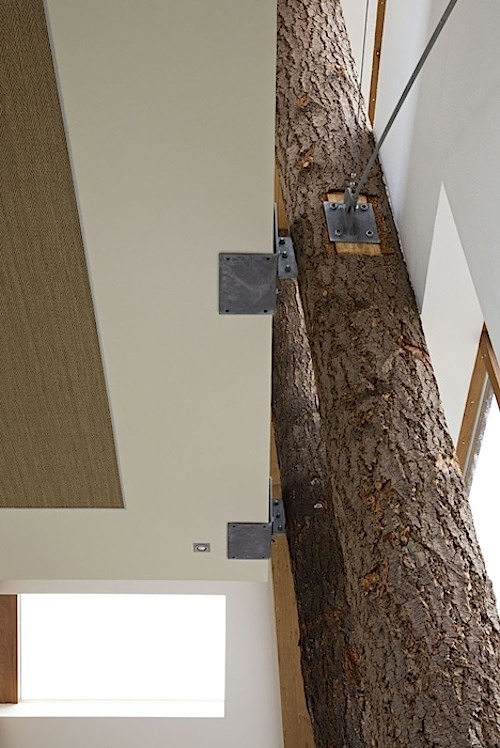 The metal connectors look particularly brutal attached to the raw tree trunks, quite unlike the effect of seeing the same kinds of connectors in normal timber construction. The architects seem to be making a statement that makes us rethink our relationship to the trees which support so much of our infrastructure. 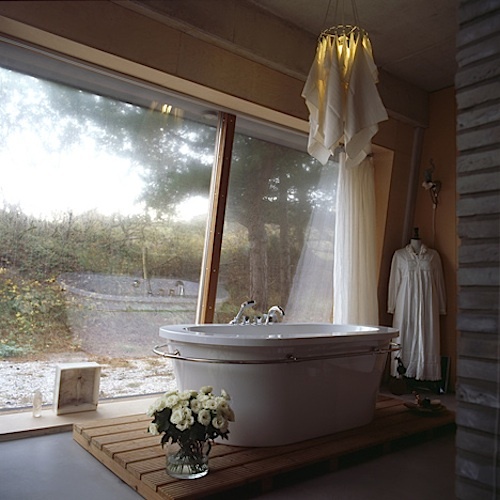 A charming bathroom puts the bather in touch with nature. 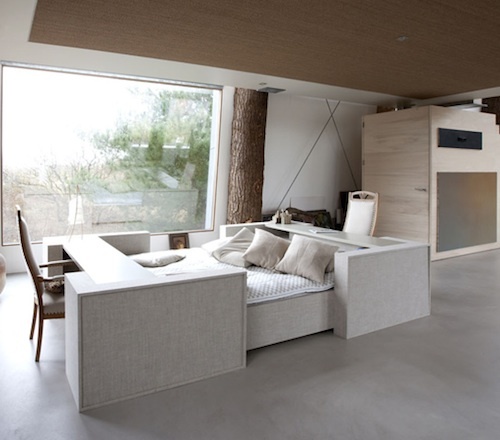 But the most innovative aspect of their home is this super-space-saving double bed/desk for two. Viewed from in bed, what appears to be a huge bedroom has abundant space. Yet, viewed from work desks at the foot and the head of the bed, the ‘workspace’ also enjoys an equally spacious place that really doesn’t feel like working in a bedroom. By day, the bed is now simply a resting spot for laptop use for work. (Even better might be if both chairs are in the headboard desk, so that from the bed you don’t sense a ghost of yourself working at the foot of the bed when you are trying to relax. 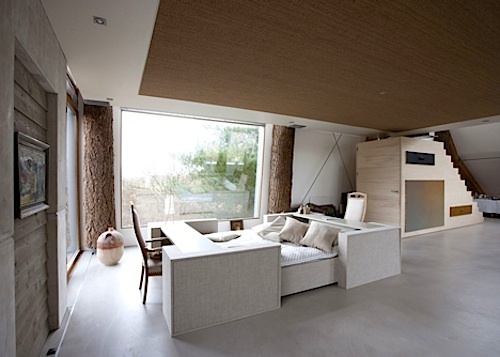 Seen from the other end of the loft type open space, where clients would be consulting plans, the bed/desk in the distance is in no way construed as a bedroom. There is the sense of an extended studio space. 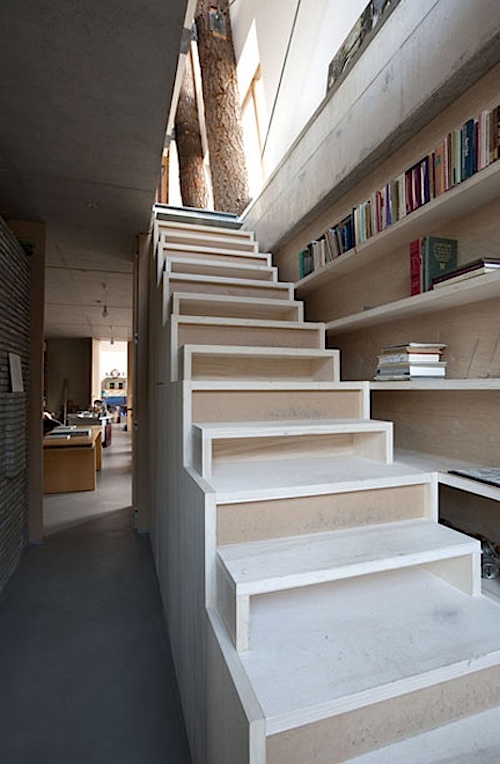 This is a very clever way to hide a bedroom in plain sight in a live/work situation. This entry was posted on Wednesday, February 5th, 2014 by Susan Kraemer and is filed under Architecture. You can follow any responses to this entry through the RSS 2.0 feed. You can leave a comment.